Retailer House of Fraser has announced plans to shut 31 of its 59 stores across the UK and Ireland as part of a rescue deal, impacting around 6,000 jobs. Four Yorkshire stores are affected and members of staff have been informed. 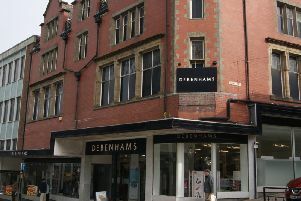 The stores in Yorkshire that are set to close under the Company Voluntary Arrangement, which will require approval from creditors who will make their decision on June 22, are Grimsby, Doncaster, Hull and Skipton. The full list of store closures is as follows: Altrincham, Aylesbury, Birkenhead, Birmingham, Bournemouth, Camberley, Cardiff, Carlisle, Chichester, Cirencester, Cwmbran, Darlington, Doncaster, Edinburgh Frasers, Epsom, Grimsby, High Wycombe, Hull, Leamington Spa, Lincoln, London Oxford Street, London King William Street, Middlesbrough, Milton Keynes, Plymouth, Shrewsbury, Skipton, Swindon, Telford, Wolverhampton, Worcester. Two stores are excluded from the CVA proposals - Dundrum in the Republic of Ireland and Beatties in Solihull because they are separate legal entities. As part of the CVA process, House of Fraser also plans to relocate its Baker Street head office and Granite House office in Glasgow to new locations to help cut costs. The company said it expects stores that are scheduled for closure to remain open until early 2019.